He felt the hatred welling up inside him, a wild, uncontrollable hatred against these people who killed for money without caring who they killed and why. . . . [he] proceeded to smash his opponent’s face and chest repeatedly against the wall. On the last two occasions, [the man] was already unconscious, his clothes soaked with blood, but [he] kept his grip and raised the large limp body, ready to strike again. “That’s enough now,” says Martin Beck, but there’s no sign that anyone, including Beck, is surprised or moved in any way by the violence shown. In contrast, the alt-assassin is treated sympathetically–during her initial interrogation (which even seems the wrong term to use) Beck offers her food, proposes that they resume after she’s had a rest, and generally gives her every consideration. There’s no question that her action is political, in the broadest sense of the word. She aims (pun intended!) at the head of a state that has shown her only indifference or hostility through its pervasive but ineffective bureaucracies. Nobody in particular has done her any harm: the problems and injustices she faces are systemic. What recourse does one individual have, in such a situation? “She realized,” her lawyer explains, “that someone must bear the responsibility”–and so she has acted, with a slightly pathetic naïveté. ‘It does seem a bit pointless,” one policeman remarks; “They’ll find another one just like him inside half an hour.” But her lawyer suggests, that “she is wiser and more right-thinking than most of us.” It’s almost a call to revolution, except that it’s so carefully embedded within the particularities of the case and of the wind-bag lawyer that its risk is contained. Still, it’s out there, as an idea, and the direction of our sympathies towards someone who has basically turned political terrorist because of the repeated small ways she has, in her own private life, been terrorized, is consistent with the overall message of the series that violence generates violence, and that we should not be too quick to equate legality with justice. “I oppose the arraignment,” said the defense counsel. “Why?” asked the judge, a flash of genuine surprise in his voice. just the kind of evening everyone hopes for more of. When everyone is relaxed and in tune with themselves and the world around them. When everyone has eaten and drunk well and knows they are free the next day, as long as nothing too special or horrible or unexpected happens. If by “everyone” we mean a very small group of humankind. Four people, to be exact. The restoration of order and domestic harmony promised by the form of the detective novel is offered but promptly rejected or subverted. Even if that harmony is achieved, it is only for the fortunate few, and even they enjoy it only precariously, only until it is broken once again. In the Martin Beck books, such happy moments actually happen often, but it seems to be a law that the more comfortable you are with your aquavit and your book, or your lover, the more likely it is that the phone will ring and pull you back into the corrupt world. What hope does one individual have against all the wrongs, all the injustices, all the stupidity? The one person who has taken a stand in this book has been labelled insane and locked away, destroyed, not helped. Martin Beck’s long-time partner, Lennart Kollberg, offers his friend some consoling perspective: “Violence has rushed like an avalanche throughout the whole of the Western world over the last ten years. You can’t stop or steer that avalanche on your own. It just increases. That’s not your fault.” “Isn’t it?” asks Beck. “Kollberg … looked at Martin Beck and said, “The trouble with you, Martin, is just that you’ve got the wrong job. At the wrong time. In the wrong part of the world. In the wrong system.” “Is that all?” Becky drily responds. Clearly these are books with a political agenda, and moments like these are didactic, riskily so. I think they are dramatically effective, however, because they are rare, and because the series shows no crusading or utopian zeal. In its world, systems are necessary. Bureaucracies are imperfect but essential. Some good police work is better than none; trying to find a just outcome is better than not trying. Change is slow. Work is hard. Patience is a virtue. Life is bleak, but there are small pleasures, like dinner with friends. Martin Beck has no illusions, but he still shows up every day and does his job. It’s an unimpressive but ultimately quite moving form of moral heroism. I think I may choose The Terrorists for my class in the fall. Usually when approaching a series I assign the first one, as it often makes most obvious what is going to be different, how this author will bend and reshape the conventions of the genre. That also gets me out of the awkward backstory problem (teaching Gaudy Night, I’m always tempted to [and often do] interject with context from the previous books). 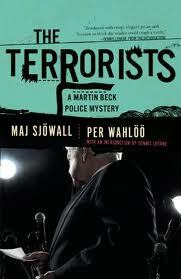 But here, though I think all the ones I’ve read are outstanding, and Roseanna would be a really interesting book to read right after studying hard-boiled detective fiction and then Ed McBain, I think this one makes the political work Sjöwall and Wahlöö are doing most evident, and that is something that really does make their series distinct. It shows a conviction (one often echoed by today’s practitioners of the genre, such as Ian Rankin) that the detective novel really be both artistically effective and ideologically significant, and not just as a means for celebrating and protecting the status quo. That doesn’t mean Sjöwall and Wahlöö are necessarily successful or persuasive in every aspect of their project, but I think it will give us a lot to talk about. I don’t often go for this genre as I usually end up prioritising others but this posting has reminded me that I do actually enjoy it. I haven’t read any of the Martin Beck books but your enthusiasm makes me fell as if this is a woeful omission in my cultural frame of reference. I’ve not only never really dabbled in crime fiction, or even really mysteries for that matter, and although Sweden is an area of the world I’ve hardly ever read about or focused on, this review has made me want to do both! I also think that this book sounds like an interesting one to assign to a class, especially to talk about issues like physical violence versus more manipulative forms as well as the intersections between literature and social commentary. Thanks for the great review! @thewritingwoman, I was steered to these books when I had a hard time grasping the appeal of Henning Mankell’s, and not only have I found them extremely smart and interesting on their own, but they have also helped me understand better the tradition Mankell and other Scandinavian crime writers are working in. But the bottom line for me is just that they are very good books on their own terms. What would it mean for Sjöwall and Wahlöö to be “successful or persuasive in every aspect of their project”? The revolutionary overthrow of democratic government? Something else? I wonder. What makes me ask is your last sentence there, that they don’t make you want to go to Sweden. Isn’t Sweden kind of, I don’t know, kind of awfully nice? To what extent are Sjöwall and Wahlöö, and Mankell, trying to represent the Sweden they observe, and to what extent is it a dark fantasy Sweden? This is not a criticism – I am pro-fantasy! @AR: I meant to question whether they are ‘successful’ rhetorically, as in, I don’t know if their (basically Marxist) critique is justified or coherent (not knowing anything, myself, yet, about Sweden in the 1960s and 70s)–I’ve read some commentaries that find nothing better than leftist posturing in it. I don’t think they really are calling for violent revolution, since the overall tone of the books is (I think! again, much of my analysis is really preliminary here) resigned. I suspect that’s why they gave the defense lawyer that big speech, not Beck: it contains it. I don’t want to pretend that an invocation of Marx ins 1975 Sweden means the same thing that it would in a different time or place. I know enough about the history of French and Italian Communism to be wary. That last quotation you give returns us to the 19th century, doesn’t it, to Dickens and Gaskell and so on. Maybe less materialism, less ruthlessness, more sympathy is the answer. But maybe the emphasis should be on “ruled” – maybe the “rulers” can be replaced. I’m not really arguing with the book, and I read Roseanna long ago and liked it all right. I’m just curious about how much punch the political statement is really supposed to have. How much can detective fiction – any fiction – actually do? * I could look that last bit up, but I think Sweden, circa 1970, had the most equal income distribution of any free country. A 0.25 Gini is the rough statistic I’m carrying around. Could be wrong! The CIA World Fact Book gives the Gini index for Sweden in 2005 as .23, down from .25 in 1992. I can’t (easily, at least) dredge up information about 1970. I note this, from the very authoritative site Wikipedia: “Sweden has a low Gini coefficient for income distribution but a significantly higher Gini coefficient for wealth (for instance 77% of the share value owned by households is held by just 5% of Swedish shareholding households).” Obviously, I would need to do better research than this to do my own analysis of the economics of mid-20thC Sweden–though I wouldn’t presume to do that, but would just to grasp enough to contextualize Sjowall and Wahloo’s perspective. If the Gini is 0.25 now, it would have been substantially lower, using that calculation, in 1970. Sweden has experienced a similar pattern of increasing income inequality as everyone else. But this is part of what makes me fretful. If what we really want is a higher marginal income tax on the wealthy, or a more equitable distribution of income, or improvements in the bureaucratic efficacy of the social safety net, Karl Marx is unnecessarily powerful medicine. So I suspect there is something else behind it. In that Marklund quote, there seems to be a mixup of which side represents “reality” and which “utopia.” If the reality is one of the lowest homicide rates in the world, perhaps some self-righteousness – or, let’s say, pride in the fact – is in order. Rohan, sorry I should have posted here before but the weather has been so good here over the past few days that I’ve had to get to work in the garden – something I hate. I’m the black sheep in a long line of market gardeners! As you’ve seen, I’ve just read the first of these novels and so I’m not really in a position to comment on the social and political implications of the series as a whole. However, given the ‘punishment’ the Swedish system takes in the Larsson novels I would be surprised if someone hadn’t decided to challenge the populist view in previous books. For myself, while I will be interested in the way that side of the novels develops, I’m going to be much more concerned to look at the way the writers deal with the narrative arc and whether they will try to sustain it over all ten novels as well as in the individual books. Unfortunately, in order to assess that I really ought to read them straight through, but getting hold of the earlier volumes is proving difficult and to look at what I’m interested in I definitely have to read them in order. I’m not much of a gardener myself. Luckily, it will be June before gardening season begins here anyway! That’s a very interesting issue about the narrative arc of the books. There are certainly continuities, and different characters go through their own arcs, but I wonder if there’s a large-scale story across all ten books. They aren’t hard to find electronically, by the way–here, at least, they are available through Kobo in the nice new Vintage editions.